This pattern for "An Effective Tray-Cloth Edging" is from "The Home Art Crochet Book" (1912) edited by Flora Klickmann. The book is available freely at The Antique Pattern Library. The pattern is found on page 12 of the book, under Section I, Edgings for the Average Worker. 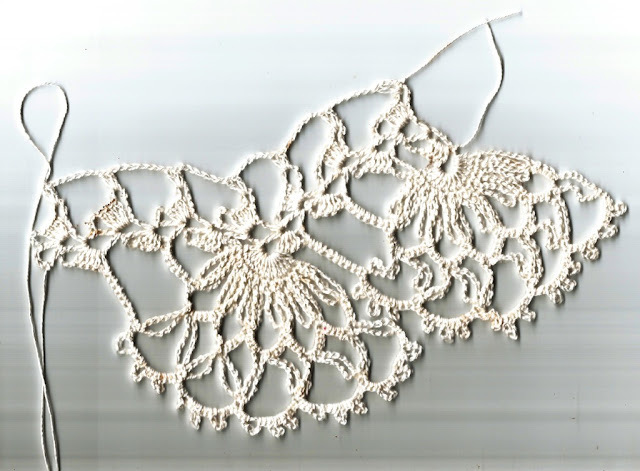 I reproduce the original antique pattern here and provide a version I have edited for the modern crocheter. 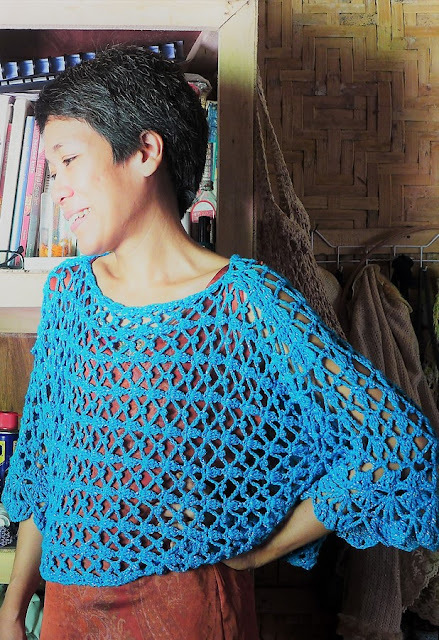 For the example shown, I used crochet cotton size 10 and 0.9mm crochet hook. 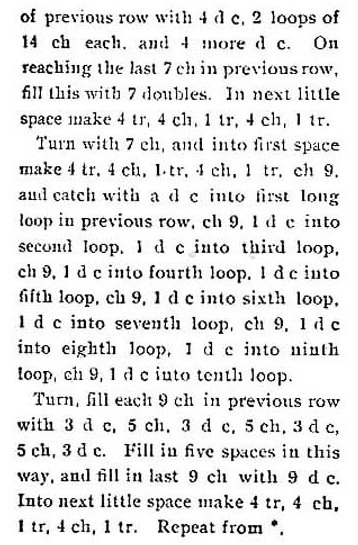 Row 1: Ch 7, in ring make (4 tr, 4 ch, 1 tr, 4 ch, 1 tr). Ch 7, turn. Row 2: In first sp make (4 tr, 4 ch, 1 tr, 4 ch, 1 tr), ch 4, in last 7-ch sp make 12 tr. Ch 14, turn. Row 3: Dc in first tr, *ch 14, dc in next tr; rep fr * to make a total of 12 14-ch loops over the next 12 trs; ch 4, sk next 4-ch sp, in next 4-ch sp make (4 tr, 4 ch, 1 tr, 4 ch, 1 tr). Ch 7, turn. Row 4: In first sp make (4 tr, 4 ch, 1 tr, 4 ch, 1 tr), ch 7, 1 dc in top of first 14-ch loop, 1 dc in top of next 14-ch loop, *ch 7, 1 dc in top of each of the next two 14-ch loops, rep fr * until the last loop. Turn. 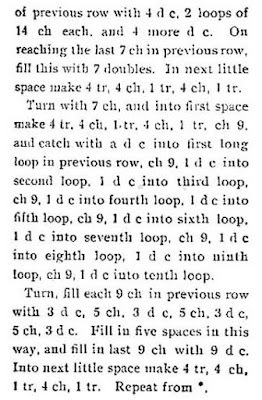 Row 5: Fill in each of the next five 7-ch sps with (4 dc, 2 loops of 14-ch each, 4 dc) (this makes 10 14-ch loops); in last 7-ch sp make 7 dc, in next little sp make (4 tr, 4 ch, 1 tr, 4 ch, 1 tr), ch 7, turn. Row 6: In first sp make (4 tr, 4 ch, 1 tr, 4 ch, 1 tr), ch 9, dc in top of first 14-ch loop, ch 9, dc in top of second loop, dc in top of third loop, ch 9, dc in fourth loop, dc in fifth loop, ch 9, dc in sixth loop, dc in seventh loop, ch 9, dc in eighth loop, dc in ninth loop, ch 9, dc in tenth loop, turn. Row 7: Fill in each of the next five 9-ch sps with (3 dc, 5 ch, 3 dc, 5 ch, 3 dc, 5 ch, 3 dc). In the last 9-ch sp with 9 dc. Into next little sp make (4 tr, 4 ch, 1 tr, 4 ch, 1 tr). Ch 7, turn. 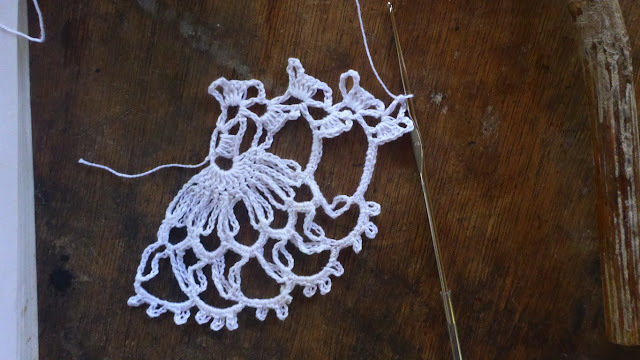 Rep Rows 2-7 to make lace edging of desired length. Fasten off. Join thread to first 7-ch turning loop with dc, ch 3, tr in same loop, *ch 6, 2 tr in next loop, rep fr * along the top of the edging.